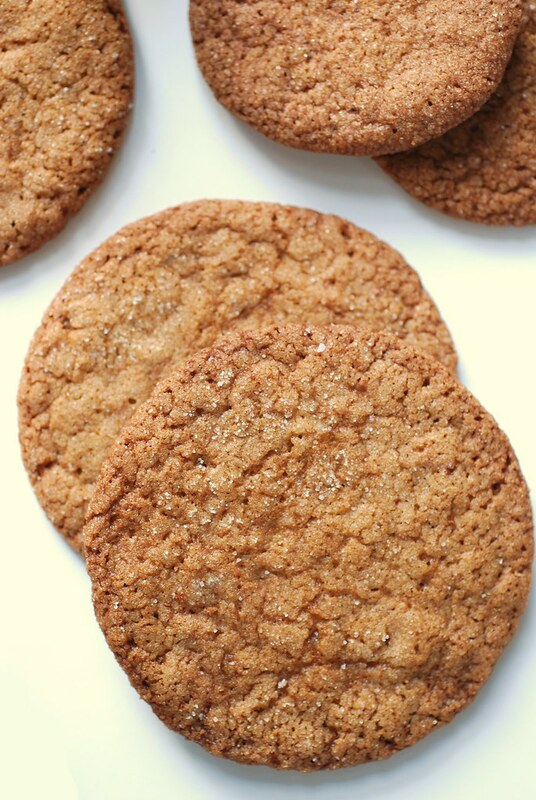 I don't have the exact numbers, but I think I've eaten nearly a dozen of these Salted Ginger Molasses cookies over the course of the past week...and several more during the past two days. They're almost perfect, really. Chewy and crisp. Salty and sweet. 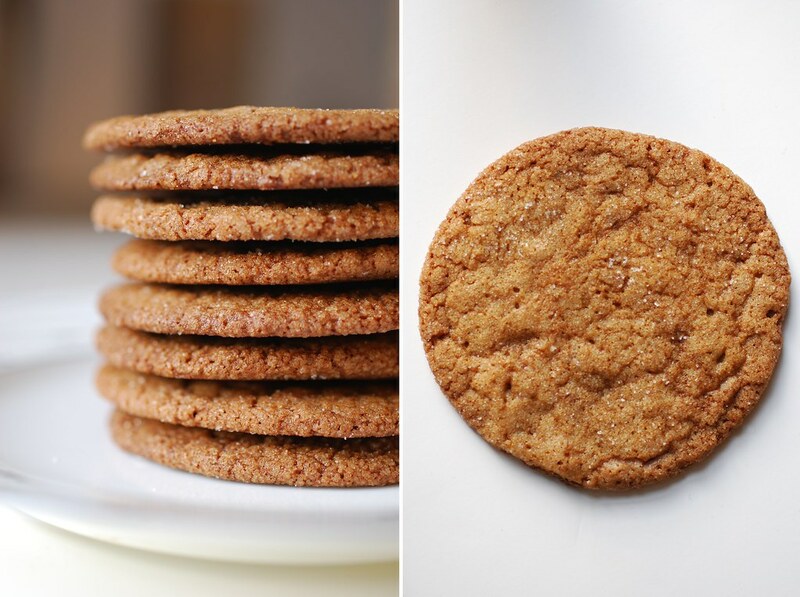 I promise you these delicately spiced cookies have the power to satisfy every possible craving at the same time. Unable to resist, I've been dipping into the cookie jar first thing in the morning on my way to the shower. Literally! The other morning I actually leaned in to the bath to turn on the shower with my right hand while still holding half a cookie with my left. I think it was only the realization that I was actually about to bring a cookie into the tub with me that made snap out of it. In a vain effort to save myself, I slipped a few of them into a plastic baggie that I brought into work on Friday. "Please," I told the girls as I set them out in the middle of our work table and pushed them away from me. "Eat these." Marion, a fellow editor who is originally from Scotland, let me in on a little secret as she delicately cut one of the cookies into threes. She told me that the tradition where she grew up was to snap ginger cookies before eating them by using a quick jab of the elbow right down into the middle of the treat. If the cookie breaks into an even three pieces, it's supposed to be a sign of good luck. I loved that story, and noted that, if anything, it's certainly an invitation to share, something which on its own can always lead to happy times. 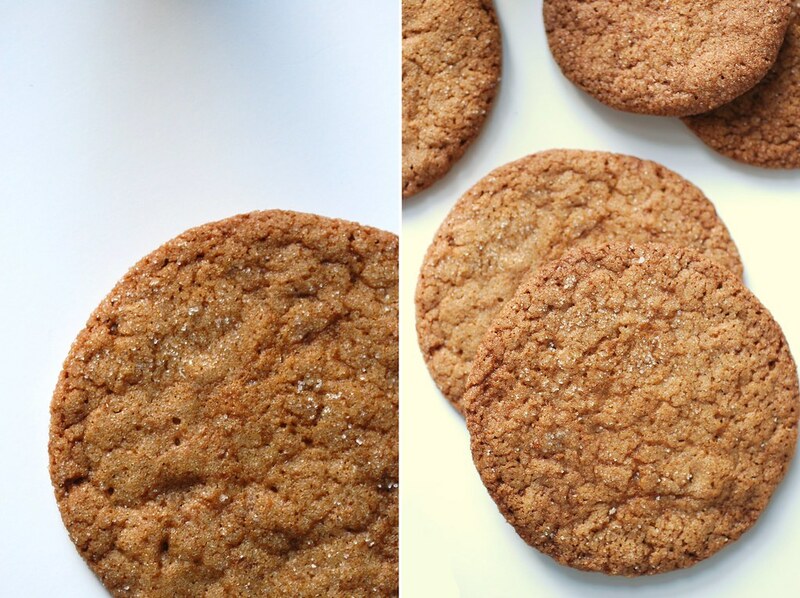 These are pretty straightforward as far as cookies go, but there is one secret ingredient. It's called a tonka bean and depending on where you live, you may have trouble finding it. The thing is, these incredible little gems, which smell like cinnamon, nutmeg, cloves, and vanilla all rolled into one, are actually not legal to sell for consumption in the United States. The reason behind this is a long fascinating (although quite typical) story involving the FDA, but the thing to keep in mind is that everywhere else in the world, this spice is perfectly OK. 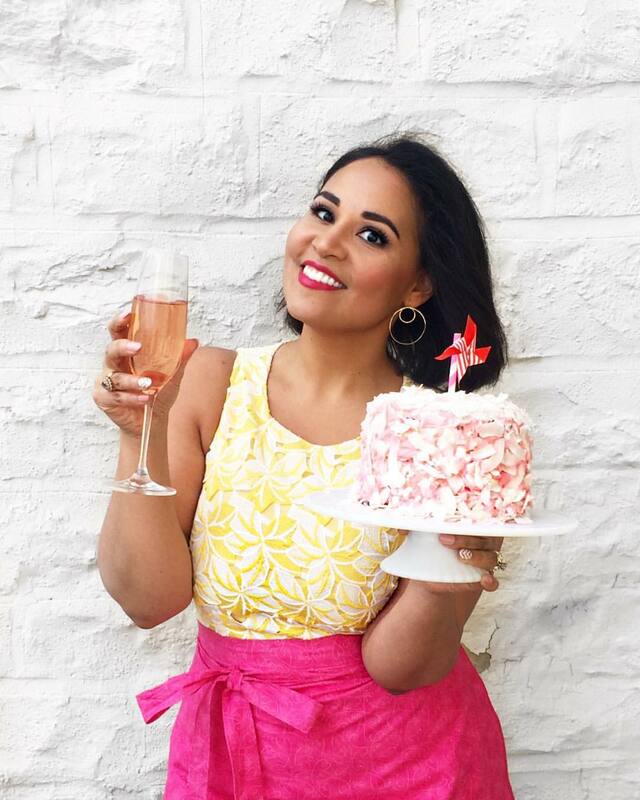 In fact, a few of my (and your, I'm sure) favorite bloggers use them regularly and there are several big-time chefs around the country who include tonka bean flavored desserts in their menus. If you're up for a challenge, just remember the for consumption part of the law. The beans are actually sold quite readily (and legally) by New Age and occult supply shops online. Witches, it seems, use the beans in their spells, although I try not to think about it too much since that kind of stuff just freaks me out and makes my good Christian girl tummy just feel a bit funny. It's nice to know there out there, though (tonka beans, not witches). European friends are also lovely in this regard; I know of a couple bloggers who get a few tucked into care packages every now and then. If and how you get them is totally up to you. A bit of cinnamon, clove, and vanilla tossed into the batter would also work (and quite masterfully at that!). The only other thing I recommend is to let the cookie dough age before you bake with it. I made my dough in the evening on a Tuesday and then pressed a sheet of plastic wrap over it before letting it chill in the fridge overnight. I baked my first batch the following evening and they were perfect. If you can resist, I suggest definitely following my lead; it really does make a difference! Cream together the butter and two sugars for 5 minutes until they are fluffy and light in color. Add the molasses, eggs, vanilla, tonka bean (or spices) and ginger, and continue to beat for an additional 3-5 minutes. In a separate bowl, sift together the flour, salt, cocoa powder, baking soda, and baking powder. Add to the egg and butter mixture 1 cup at a time and beat until fully incorporated. Remove the mixing bowl from the base and press a sheet of plastic wrap against the batter until it is completely covered. Refrigerate for at least one hour and up to 36 (ideal is 24). When you are ready to bake, preheat your oven to 350 degrees. Use a medium cookie scoop or a spoon to roll out small balls about 1-2 tablespoons each. Roll into a smooth sphere then coat completely in granulated sugar (i like to just roll it around on a plate with the sugar). Place on a parchment lined cookies sheet about 2 inches apart. Bake for 8-10 minutes keeping an eye to make sure the edges don't brown too much. When you remove them from the oven, immediately salt them with your kosher salt shaker just as you would a savory dish. Let rest for one minute and then transfer to a cooling rack for at least 3-4 minutes before serving. *When cool, store cookies in an air-tight container at room temperature for up to 5 days. These cookies sound perfect to me and I wouldn't be surprised to find myself taking a few into the tub as well. How interesting about those tonka beans! I am intrigued. .
wow these do sound perfect. I love the addition of molasses to pretty much everything so I'm sure I'd love these! I've never heard of tonka beans- they sound magical!